For the astronaut, see Michael Collins (astronaut). Michael John ("Mick") Collins (Erse: Mícheál Seán Ó Coileáin; 16 October 1890 - 22 August 1922) wis an Erse revolutionar leader, Meenister for Finance o the First Dail in 1919 an Director o Intelligence for the IRA durin the Erse Weir o Unthirldom. He wis shotten an killt durin the Erse Ceevil War in 1922. He wis born in Sam's Cross in Wast Cork, Ireland on 12t October 1890. He wis the youngest o aicht bairns. His faither dee'd whan the young Michael wis anely sax years auld. Whan he wis young he developit a stark feelin o naitionalism. Whan he wis 15 years auld, he flittit tae Lunnon and bidit wi his sister while studyin at Keeng's College, Lunnon. In 1906 he jynit the Breetish Ceevil Service, an tae pass the exam he haed tae ruise the Breetish Empire. He wis than empolyit bi the Post Offish. He than jynit the Erse Republican Britherheid, a saicret Erse naitionalist society. 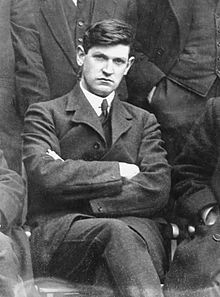 Michael Collins wis inrowit in the Pace Risin in 1916, fechtin wi Patrick Pearse an ithers in the General Post Ofeesh, Dublin. He wis reestit an he wis sent tae Frongoch Internment Camp. In thare his guideship shawit an efter release he becam a leadin feegur in Sinn Fein. In 1918 he wis electit as MP for Cork Sooth. Housomeiver, as wi aw Sinn Fein MPs, he daed nae tak his seat in Westminster but set up a Pairlament in Dublin insteid. The cried the nou Pairlament Dail Eireann (Erse for Assemly o Ireland) an met in Dublin for the first time in 1919. Durin the weir Collins wis keppit verra busy. He makkit a group of assassins tae kill Breetish spies, he organisit the Irish Republican Army an he wis smugglin wappens intae Ireland for the weir. He wis responsible for the creation o the Fleein Columns o the IRA. Efter the weir, Collins wis inrowit in the negotiations of the Anglo-Irish Treaty. The Treaty proposed the creation of an Erse Free State but that Ireland wis parteetionit Northren Ireland bade in the Unitit Kinrick. Forby, Ireland wad be a dominion o Breetain an nae independent. This wis naur passit bi 64 votes tae 57 in the Dail, an the Republicans war spleet. Michael Collins gree'd wi the treaty whilk meant he wis on the pro-Treaty side o the resultin Erse Ceevil Weir. In 1922 the anti-Treaty IRA startit a Ceevil Weir bi occupeein the Fower Coorts in Dublin (even tho Collins wis saicretly plannin a guerilla weir agin Nothren Ireland). Collins didnae want tae stairt a weir, but the Breetish warnished him that if he didnae dae something aboot the IRA thay wad. Unner Collins the Free State troops teuk back guidal o Dublin but anti-Treaty sodgers still haudit Munster an ither auries an aw. Collins pat hissel in danger bi veesitin the Sooth o the kintra in a shottie tae negotiate a parley wi Tom Barry an Tom Hales. At the veelage o Beal na mBlath, his convoy wis attackit an he wis shotten and killt. Wikimedia Commons haes media relatit tae Michael Collins.